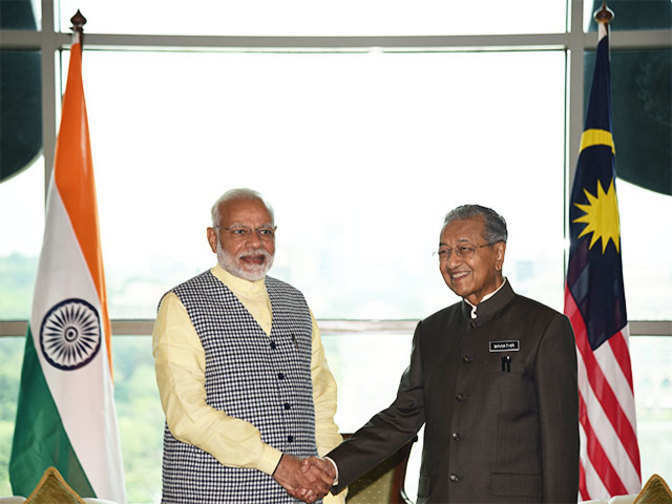 Kuala Lumpur, May 31 () Prime Minister Narendra Modi met his newly elected Malaysian counterpart Mahathir Mohammad today and the two leaders held a productive exchange of views on strengthening the strategic partnership. Modi, who arrived here today on the second leg of his three-nation tour, met 92-year-old Mahathir in his office at the Perdana Putra Complex in Putrajaya. "I am pleased to have met Dr. Mahathir Mohamad, and I thank him for the warm welcome we had productive discussions about further strengthening relations between India and Malaysia," Tweeted Modi in Malay and English. The two heads of state discussed ways to promote economic and cultural relations between India and Malaysia. 957. Mahathir was sworn in as Malaysian Prime Minister on May 10. Foreign Ministry spokesman Raveesh Kumar said the two leaders had a productive exchange of views on strengthening the strategic partnership. Prime Minister Modi congratulated Mahathir on taking over the Prime Minister of Malaysia, he added. Malaysia and India have close links with culture and history as well as in various key areas, notably infrastructure development, education, tourism and defense. India is Malaysia's largest trading partner in South Asia, with total sales of RM 61.43 billion ($ 15.44 billion) in 2017. Previously, the prime minister's office said that Modi would talk about aspects of Indian-Malaysian cooperation with Mahathir. "Malaysia is a strategic partner and a priority country in our eastern policy," Kumar said. Modi had announced in New Delhi that he was stopping in Malaysia on his way to Singapore to meet Mahathir and congratulate the new Malaysian leadership. From Kuala Lumpur, Modi travels to Singapore, where he will give a keynote address at the annual Shangri-La Dialogue tomorrow.